The AWE report and associated results should not be used to replace the advice of a qualified professional. If you are experiencing significant psychological difficulties you should contact your school counselor, teacher, parent or guardian, doctor, or a qualified mental health professional. AWE determines an "adult" as a person over the age of 18 who is involved with the school and who have been invited by the school to participate in their schools assessment. An adult could be a staff member or parent of a student at the school. Examples of staff members include the school principal, teachers, school caretaker, support staff, and board of trustee members. The adult user visits AWEs' website, registers an account and selects their school and identifies as a staff member or parent, conducts an assessment, and receives an adult wellbeing report. AWE determines a "student" as a 8 to 18 year old student of the school. The student visits AWEs' website, registers an account and selects their school and identifies as a 'student', conducts an assessment, and receives a student wellbeing report. Yes, if you are an adult or student user. AWE charges schools for your access, and also for the schools wellbeing reports. Yes you can. We only ask that you do not share your individual results in any other commercial setting (e.g., in therapy, coaching, or employment situations outside of the school). If you wish to do that, we suggest you use Work on Wellbeing. 5. Do I have to share my results with my school? Yes and no. If you are a staff member, parent or student user, you agree by participating that a school report can be complied using aggregate (group level) anonymous data - which includes individual staff, parent and student user data. No school should force its staff, parents or students to do an AWE assessment. If you are a staff member, parent or student user, your school will determine how often it would like you to complete an assessment - monthly, quarterly, half-yearly, yearly, or on its own custom dates. You will get an email reminder in line with the frequency that your school specifies, and it is likely your school will also remind you through their usual communication channels. If you have not been invited by your school to use AWE, you are not permitted to use AWE. If you are a staff member or parent, an assessment is about 52 questions and takes just under 10 minutes on average to complete. If you are a student, an assessment is 29 questions and takes about 4 minutes on average to complete. These times will be extended if your school has added more questions to the core assessment. You can view an example pdf report on the "assessments & reports" page. In addition, your user dashboard displays a graph and summary text from your last assessment. 10. How is my wellbeing "tracked"? 11. How scientific is the AWE assessment? The AWE assessment has been crafted by top wellbeing assessment scientists in the field. You can view a copy of the assessment technical manual on the "assessments & reports" page. This manual explains how the assessment and questions are grounded in relevant theory and literature. 12. How does an AWE assessment compare to other wellbeing assessments? We think an AWE assessment is the best available for assessing positive education in schools, and wellbeing in school communities. 13. Does AWE provide wellbeing programmes and initiatives? No. AWE is in the business of providing wellbeing assessments only. If you are a staff, parent or student user, you choose who you would like to share your results with (in a non-commercial way). However you agree by participating that a school report can be complied using aggregate (group level) anonymous data - which includes individual staff and student user data. In this report, no identifying characteristics are mentioned - a minimum of 10 student responses and 5 adult responses is required to produce an overall school report, and for each subgroup, a minimum of 5 responses is required to produce a result for each sub-group - ensuring user anonymity. If you are a student user, if you receive a low wellbeing warning in your report or you score a 7, 8, 9, or 10 on the bullying question (a score of 10 indicates bullying "all of the time"), and you give consent, your name will be provided to the person(s) at your school who are administering the AWE account. 15. How secure is AWE? With the assistance of security consultants and health information privacy experts, we are ensuring that AWE's security measures meet the most stringent requirements. As a result of AWE maintaining appropriate measures and standards, users can rest assured that their personal data is protected. 1. What should our school do if our school wellbeing is low? If you judge that your school report indicates that your school has low wellbeing, then we suggest you obtain advice from professionals (e.g., coaching psychologists, clinical psychologists, organisational psychologists, educational psychologists, etc) to assist your school community (staff, parents, and students). Identifying and providing support to your staff and students with the lowest wellbeing should be a priority. 2. How much does a AWE assessment cost? There is an annual membership charge depending on your school size. You can use the dynamic features on the pricing page to see how much using AWE would cost your school. Our primary payment method is through Paypal and if you register on the site you will be taken to Paypal where you can use a credit card. Alternatively we can send you an invoice with Australian banking details. 4. Why should my school undertake an AWE assessment? See the answer to the question "Why should a school measure wellbeing?" on the "AWE Users" page (select the tab at the top of the page, or the link in the footer to this page). 5. What is the difference between an Staff user, a Parent user, a Student user, and a School user? AWE determines "staff" as employees of the school (paid or unpaid, but formally engaged to work in some capacity for the school). Staff members include, for example, the school principal, teachers, school caretaker, support staff, and board of trustee members. The staff member visits AWEs' website, registers an account and selects their school and identifies as a 'staff' member, conducts an assessment, and receives an adult wellbeing report. AWE determines a "parent" as a parent of a student at the school, and who has been invited by the school to complete an adult wellbeing assessment. The parent visits AWEs' website, registers an account and selects their school and identifies as a 'parent' , conducts an assessment, and receives an adult wellbeing report. AWE determines a "school"user as the person who registers with AWE and sets up their schools wellbeing assessment. This is the person who is in charge of the schools account with AWE, and sets the parameters for their assessments and can add their own questions to the assessment. 6. Who will see the school results and when? When a school report is generated at the end of an assessment period (the one week open and close dates for the assessment), this school report is emailed to all staff, parents and the school administrative user at the same time. The research literature has demonstrated various negative effects of organisations withholding or not sharing this type of information openly and transparently with their employees. In contrast, such open and transparent sharing initiates organisational conversations that assist in improving wellbeing. School reports are not shared with students, however AWE encourages schools to discuss results and open dialogue with students about their schools results. 7. How often can our school assess our staff, parents and students? Assessments can be taken as often as you like however it is most common to take assessments twice per yearl. Assessment periods last for either one or two weeks with reports & data being provided within 24hours of the assessment period ending. 8. How long is an assessment for a staff member, parent, and student? A staff member or parent assessment is about 52 questions and takes just under 10 minutes on average to complete. A student assessment is 29 questions and takes just under 4 minutes on average to complete. If you add your own questions or add from our library of extra measures, these time will be extended. 9. What do school results look like? You can view an example school pdf report on the "assessments &reports" page. In addition, the school administrators' dashboard displays a graph and summary text from your school last assessment. 11. Do we need to be qualified to complete or administer an AWE assessment? The AWE team are members of major professional bodies - such as psychology associations and assessment associations. There should always be caution in interpreting results from a single assessment, or from using a single method, and such information and knowledge should assist in providing a "bigger picture" of your schools wellbeing. 12. How scientific is the AWE assessment? The AWE assessment has been crafted by the top wellbeing assessment scientists in the field. You can view a copy of the assessment technical manual on the "assessments" webpage (select the tab at the top of the page, or the link in the footer to this page). This manual explains how the assessment and questions are grounded in relevant theory and literature. 13. How is our school wellbeing "tracked"? A membership period is 12 months from registration date. During this membership period, your school can use AWE as much as it wishes (e.g., conduct assessments monthly, quarterly, half-yearly, or yearly). 15. What happens if I want to add or remove staff members, parents or students from subsequent assessments? Only the school administrator account has this ability from their user dashboard. 16. Can I use AWE for a different commercial purpose - other than a school assessment? Unfortunately AWE is only available for school assessments and cannot be used in any other commercial way. You are more than welcome to email AWE to inquire though. For other purposes, we suggest Work on Wellbeing. 17. Does AWE provide wellbeing programmes and initiatives? No. AWE provides wellbeing assessments only. 18. How ethical is AWE? AWE is committed to industry standards in regard to user privacy and user confidentiality. Our guiding principal is that the user can determine who they share their data with. We are members of various major professional bodies, such as psychology associations and assessment associations, and team members are also registered test users with accredited bodies. 19. How secure is AWE? 20. Can we add our own questions to the AWE assessment? Yes. 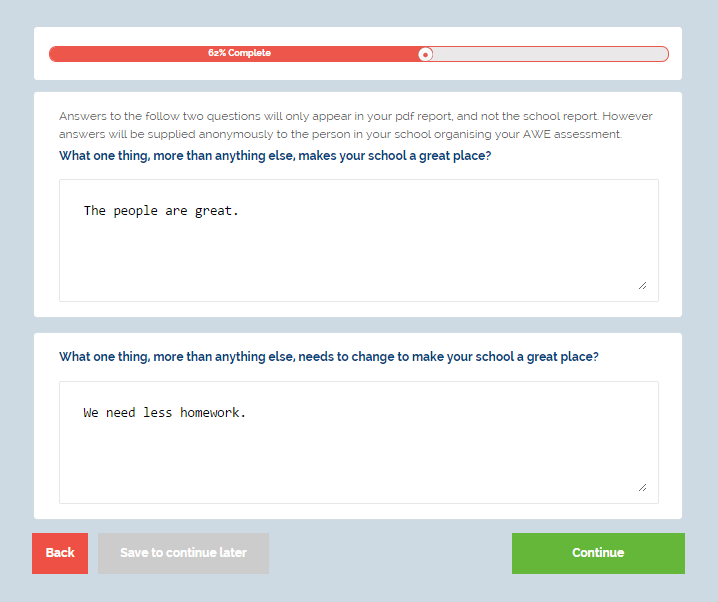 In the school user dashboard, you can add up to ten free-text questions and ten 0-10 scale questions. These added questions are presented to adults and students at the end of their AWE assessment and before their demographics page. When a school report is generated, an excel file of this raw data is saved on the school users dashboard. 21. How does our school get started? Please download and read Getting Started with AWE which outlines via screenshots the steps to setting up your first school wellbeing assessment. If you have any questions, email: info@awesomeschools.com. 22. Can we try AWE? Yes we have a demo account that allows you access to the school dashboard and you can test out the assessments. Please get in touch at info@awesomeschools.com for access details. We can also set you up with a trial to be used with a small group from your school.